In a post-apocalyptic America that has shattered into a hundred perpetually warring fiefdoms, anyone with a loud voice and a doomsday weapon can be king (and probably has been). Duncan Archer—con man, carpetbagger, survivor—has found a way to somehow successfully navigate the end of the world, with its giant killer robots, radioactive mutants, mad scientists, rampant nanotechnology, armed gangs, sea monsters, and 101 unpleasant ways to die. But when he meets Captain James Barrow, a former OSS agent and the most wanted man in the world, Duncan finds himself a reluctant hero caught up in a whole new level of weird, rollicking adventure… And the second most wanted man in the world. 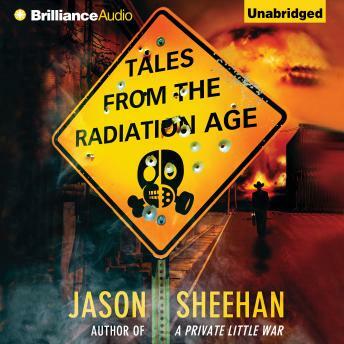 Tales from the Radiation Age is a throwback to the pulp-origins of science fiction, painting a vision of the future that’s richly detailed, wildly imaginative—and altogether too easy to imagine.